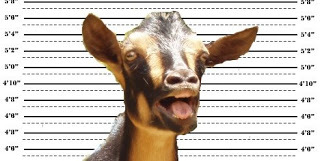 Three goats were put behind bars for damaging police vehicle. Police said the goats had a record of damaging vehicles of residents and shopkeepers, we didnt care for filing the case, as it was not our duty to go after those bakra (goats). The goats "crossed the line" said officer, when they damaged the station's new patrol vehicle, a maroon Innova. "Sh*t Man, We got the vehicle only two days ago," said an officer on duty. According to the complaint, about 12 goats dented the vehicle and climbed on top of it, "damaging the wipers and glass, and scratching the paint of the bonnet and body", when policemen went searching for the vandals, they found only three goats nearby roaming around suspiciously. "We took the animals to the station and arrested them under appropriate sections," said the officer. Police booked a case under Section 96 of Karnataka Police Act (being found under suspicious circumstances between sunset and sunrise armed with dangerous instrument with intent to commit an offence). 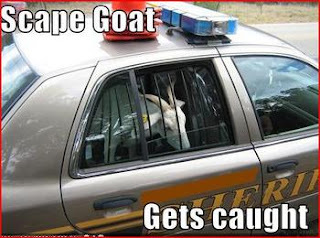 meanwhile reports coming from the "Undercover" reporter is, the goats have been put in a cage. "They weigh around 15kg which is healthy and are fed grass (usually meant for undertrials) twice a day, now they seem happier and a lot healthier after coming here," he says. Union Haw Minster Kopyl Cbal, who suggested a new bill to deal with the menace of Mass Betting, Gambling, spot-fixing and match-fixing in cricket and Chronic National Mass unemployment, has finally decided to introduce historic bill called the Shri Sarvajanik SadaBahaar Rozgar Yojana, aimed at creating a need-based National Employment Guarantee Programme, was initiated to meet demands for Chronic national mass unemployment and Entertainment requirements. Paper(betting) chits however, will be provided free of cost by the Central government as per Five year plan allocation, but the cost of transportation should be borne by the respective states and super-bookies and their agents. Any person can indulge in, by means of bookies,cricketers,towels,indirectly or directly by himself, - for any result prediction for any match as long as he covers matrimonial match-fixing option for any eligible person, where bookies should act as marriage brokers for the singles. Ranbir Kapoor was today detained and fined on undeclared branded personal goods(like towels) he was carrying meant for his friends at the Mumbai International airport, a customs official said. "The actor was intercepted when he was passing through a passage, which is strictly allowed to be used only by officials and airport staff, The actor's luggage was then checked when he was found with the branded goods such as Perfumed Towels, clothes (like mundus,lungis, color-color banians) and designer hawai footwears worth about Rs thirty lakhs which he should have declared before customs officials at the Red Channel," Officer Mera KaanKhade said.